Where Are All the Monuments to the Progressive Americans? The current controversy over whether to dismantle statues of some prominent Confederate figures is a battle over whom we admire and consider as heroes. It is also a battle over who has power to shape how we view our history. In May, the New Orleans City Council declared monuments of Lee, Confederate President Jefferson Davis and Confederate Gen. PGT Beauregard public nuisances and had them removed. In August, Baltimore Mayor Catherine Pugh ordered Confederate monuments removed from the city’s public spaces. Maryland Gov. Larry Hogan, a Republican, directed the dismantling of a statue in front of the State House of Roger Taney — a Supreme Court justice who was chief author of the 1857 Dred Scott decision that ruled that African-Americans could not be American citizens. Earlier this month, in response to student protests, Yale University renamed Calhoun College — a residential complex named for John C. Calhoun, a senator from South Carolina, vice president and influential advocate for slavery — Hopper College, after Rear Adm. Grace Murray Hopper, a computer pioneer and naval officer. To buttress the symbolism, Yale removed a portrait of Calhoun from a dining hall. Shouldn’t we also honor the organizers, activists, artists, writers, athletes, judges and occasional elected officials who fought to make the United States a more humane and inclusive country? The New York Times recently published a list of the Confederate monuments that are now subject of controversy in cities across the country. 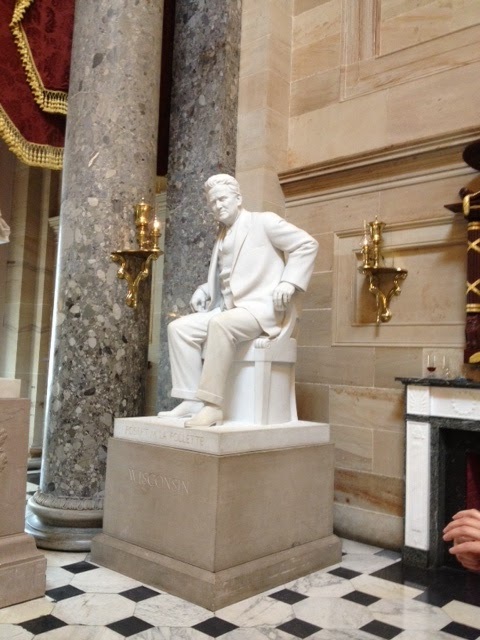 Not surprisingly, most monuments celebrate political, business and military figures. 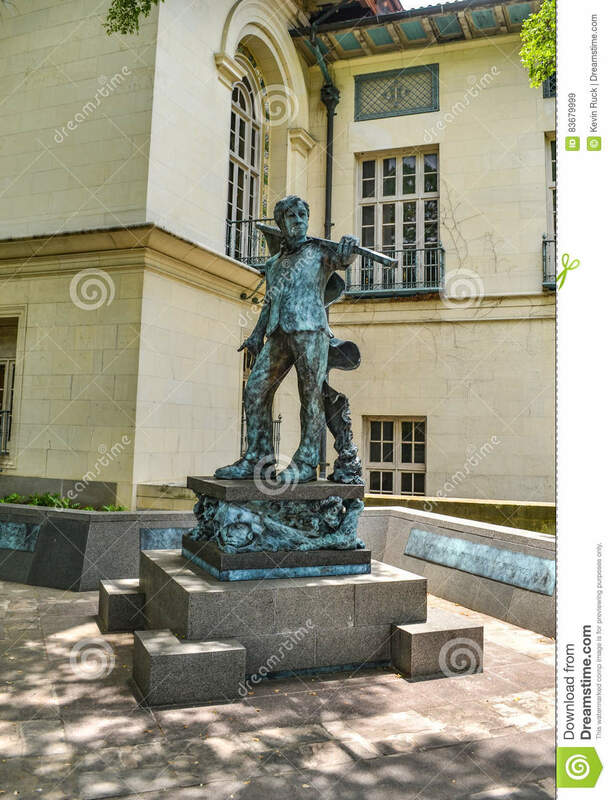 You can criss-cross the country and find statues, schools, government and university buildings, museums, parks, and streets celebrating presidents, senators, governors, jurists, inventor-entrepeneurs, founders of major corporations, generals and fallen soldiers. But our veneration of them often comes at the expense of recognizing other citizens who had a major role in shaping our nation’s history. Shouldn’t we also honor the organizers, activists, artists, writers, athletes, judges, and occasional elected officials who fought to make the United States a more humane and inclusive country? What about the pioneers who built movements and gave voice to the struggles for women’s suffrage, protecting the environment and consumers, putting an end to lynching, giving workers the right to form unions, and pushing for a progressive income tax, a federal minimum wage, old-age insurance, the 8-hour workday and government-subsidized health care and housing? When they first advanced their ideas, they were considered impractical idealists, utopian dreamers or dangerous radicals. Now we take these ideas for granted. We all stand on their shoulders. To create a partial catalogue of monuments celebrating progressive figures, I’ve drawn on the people profiled in my book, The 100 Greatest Americans of the 20th Century: A Social Justice Hall of Fame. I’ve identified statues located in public places (but not busts of heads or paintings, parks or public buildings), celebrating these progressive figures. The list focuses on people whose influence was primarily during the 20th century — so Tom Paine, Daniel Shays, Harriet Tubman, Frederick Douglass, William Monroe Trotter, William Lloyd Garrison, Mother Jones, Elizabeth Cady Stanton, Henry Demarest Lloyd, John Muir, Ida Wells, Terrence Powderly, Thorsten Veblen and Jacob Riis, among other radicals and reformers, are not included. 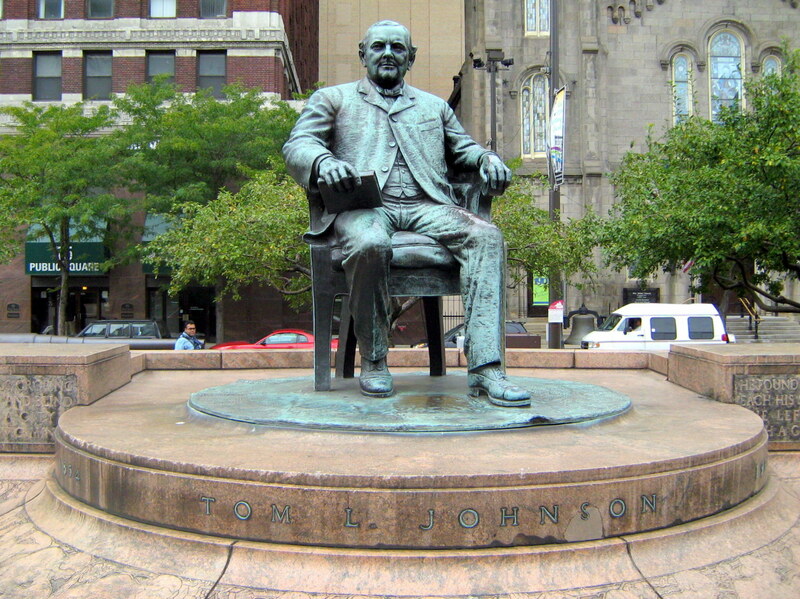 A statue of Tom L. Johnson, the progressive mayor of Cleveland from 1901 to 1909, is located in Cleveland’s Public Square. A statue of Robert M. La Follette Sr., the progressive Wisconsin governor and senator, sits in National Statuary Hall in the US Capitol. A number of public schools throughout Wisconsin are named for La Follette. Crusading lawyer and Supreme Court Justice Louis Brandeis adorns the campus of Brandeis University in Waltham, Massachusetts. Besides the university, many public schools — including high schools in New York City and San Antonio — are named for Brandeis. Attorney Clarence Darrow spent most of his career defending radicals and labor activists, but he’s most famous for defending evolution in the famous Scopes Monkey Trial. 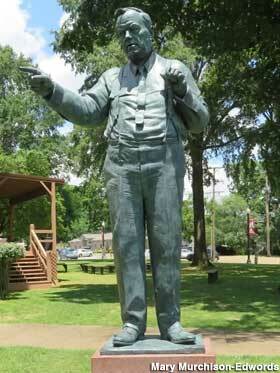 A statue of Darrow sits on the lawn in front of the Rhea County Court House in Dayton, Tennessee. It was dedicated on July 14, 2017 and sits opposite the statue of William Jennings Bryan, who beat Darrow in that controversial case. 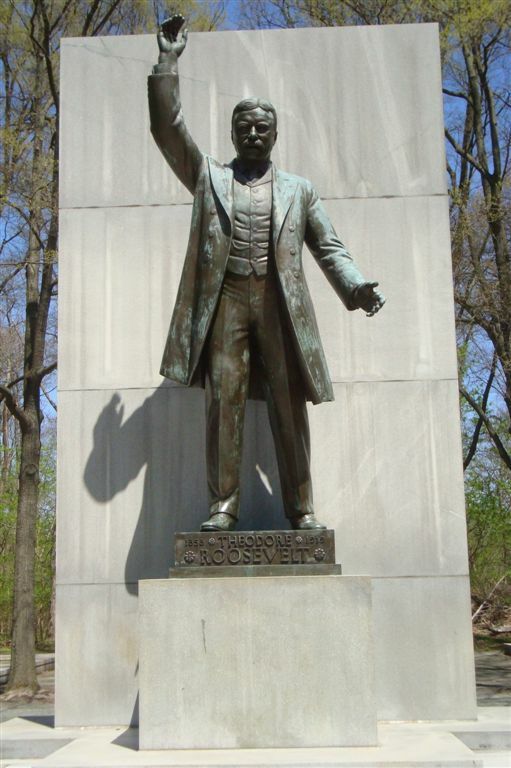 This statue of Theodore Roosevelt on Roosevelt Island in the Potomac River across from Washington, DC is one of many statues and schools named for the trust-busting president. You call also visit three national parks in honor of the environmental president. The name of progressive philosopher and school reformer John Dewey adorns public schools in Denver; New York City; Warrensville Heights, Ohio; Flint, Michigan and elsewhere, but there are no statues with Dewey’s likeness. 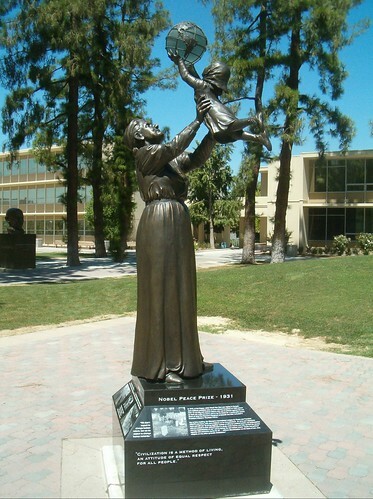 A sculpture of urban reformer Jane Addams, the first American woman to be awarded the Nobel Peace Prize (1931), can be found on the campus of Cal State University in Fresno. Schools in Seattle; New York City; Bolingbrook and Moline, Illinois; Long Beach, California and other cities are named for the founder of modern social work. Students in Sacramento can attend Hiram Johnson High School, and the public can visit the state office building in San Francisco named for the progressive governor, but there are no statues celebrating his life. A statue of scholar and activist W.E.B. DuBois is located at his alma mater, Fisk University. The main library at the University of Massachusetts in Amherst, a physics building at Fisk University, and dormitories at the University of Pennsylvania and Hampton University are named for DuBois. Public schools is Chicago, Baltimore, Wake Forest, NC, and elsewhere are named for him, too. 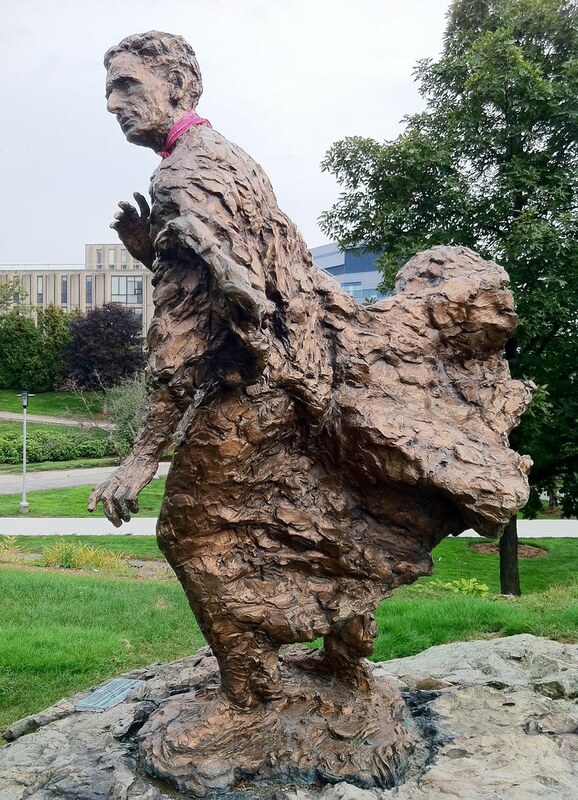 This statue of Alice Hamilton, a crusading physician who founded the modern field of occupational health, sits in Headwaters Park in Fort Wayne, Indiana. A middle school in New York City is named for Robert F. Wagner, the progressive New Deal senator who led fights for workers’ rights and public housing, but there are no statues erected to honor him. 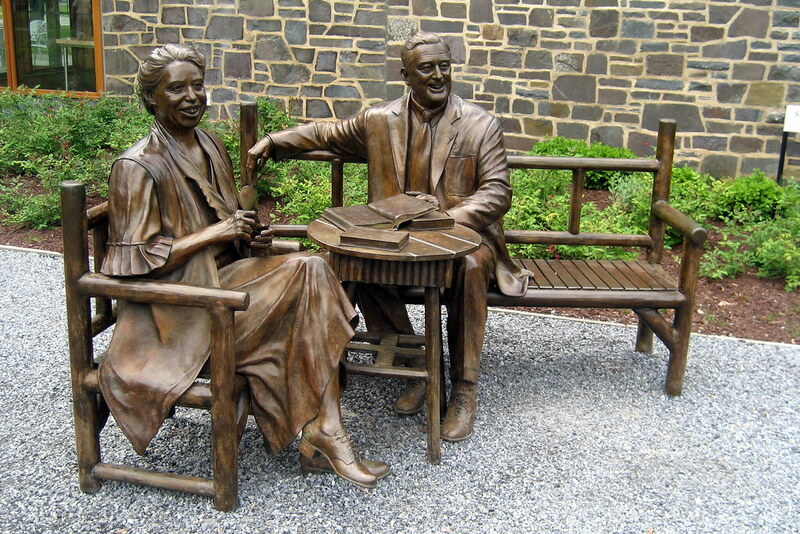 These statues of Eleanor and Franklin Roosevelt at the Roosevelt National Historic Site in Hyde Park, New York are among the many statues and schools named in their honor. A stunning recent addition to the collection of memorials is The Franklin Delano Roosevelt Memorial along the Potomac in Washington, DC. A 12-foot-high, 4-ton statue of Albert Einstein is set at the entrance to the headquarters of the National Academy of Sciences in Washington, DC. Einstein is holding a paper engraved with the equations for his major scientific contributions. There are dozens of other Einstein statues in the US and around the world and many schools named after the famous scientist and socialist. This statue of the pioneering and fearless birth control advocate Margaret Sanger, with a gag over her mouth, stands in Old South Meeting House in Boston. There are no schools named for the controversial socialist and feminist. A monument to John L. Lewis — leader of the mine workers union and later the Congress of Industrial Orgnizations (CIO) — sits in Monongahela Township, Greene County, Pennsylvania, on a site where 37 coal miners lost their lives in a mine explosion in 1962. 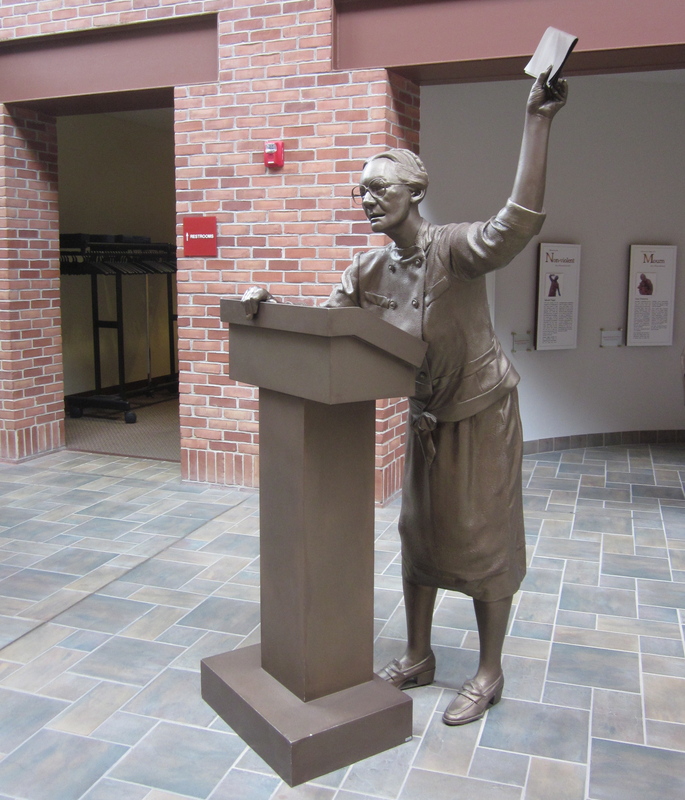 There’s another statue of the brilliant orator and labor leader at the John L. Lewis Mining & Labor Museum in Lucas, Iowa. 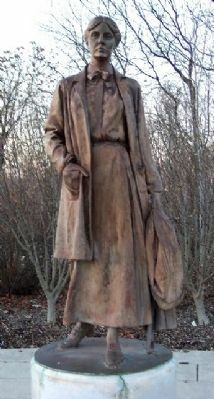 Several statues of Helen Keller portray the socialist, feminist and pacifist as a young girl learning how to speak, like this one located in Tewksbury, Massachusetts, of Keller and her teacher, Anne Sullivan. The Keller statue in National Statutory Hall in the US Capitol in Washington, DC shows her at a pump, where she spoke her first word, “water.” There are many schools around the country named for the founder of what is now called the disability rights movement. There’s no sculpture of consumer and labor activist Frances Perkins, but the US Department of Labor building and the Frances Perkins Academy in New York City are named for the first female Cabinet secretary and a crusading New Deal reformer. However, the governor of Maine recently tried to have the Frances Perkins Conference Room in the state capitol renamed in view of her pro-labor stance. 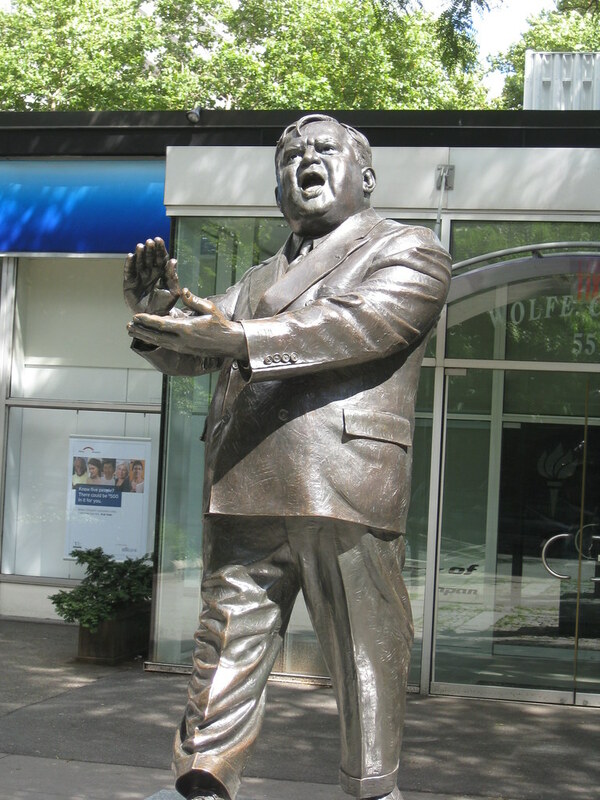 Famed New York City Mayor and congressman Fiorello La Guardia sits in the Greenwich Village section of New York City. New York’s La Guardia High School is one of the premier arts high schools in the country. Swarthmore College named a dormitory after suffragist leader Alice Paul, a graduate of the college. Montclair State University in New Jersey has also named a building in her honor. And you can pay homage to Alice Paul and other women’s rights luminaries at the National Park Service’s Belmont-Paul National Historic Site. An apartment building in Philadelphia bears the name of Sidney Hillman, the founder and president of the Amalgamated Clothing Workers of America and a key backer of FDR’s New Deal program. 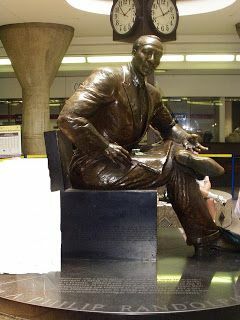 A. Philip Randolph, civil rights and labor leader and leader of the Brotherhood of Sleeping Car Porters, sits in Boston’s Back Bay Train Station. Another statue of Randolph was erected in the concourse of Union Station in Washington, DC. Schools in Jacksonville, Florida; New York City; Philadelphia and Atlanta are named in his honor. Jacksonville renamed one of its streets A. Phillip Randolph Boulevard and an A. Philip Randolph Pullman Porter Museum is located in Chicago’s Pullman Historic District. Statues of the radical Minnesota Depression-era Farmer-Labor Party Gov. Floyd Olson, including one in front of the Minnesota State Capitol in St. Paul, have been constructed throughout state. Dorothy Day, founder of the Catholic Worker movement, sits outside St. Mary’s Catholic Church in Colts Neck, New Jersey. Another Day statue can be found in front of the Solanus Casey Center in Detroit. Dormitories at Lewis University in Romeoville, Illinois, the University of Scranton in Scranton, Pennsylvania, and Loyola University in Maryland are named in her honor. Broadway Housing Communities, a supportive housing project in New York City, opened the Dorothy Day Apartment Building at 583 Riverside Drive in 2003. The name of actor, activist, singer and linguist Paul Robeson adorns public schools in Chicago, Philadelphia, New York City, and New Brunswick and Trenton, New Jersey. In 1976, the apartment building on Edgecombe Avenue in the Washington Heights section of Manhattan where Robeson lived during the early 1940s was officially renamed the Paul Robeson Residence, and the street was renamed Paul Robeson Boulevard. The main library at Rutgers University, Robeson’s alma mater, is named for him. There are no statues, but many busts of Robeson, including this one at Central State University in Wilberforce, Ohio. The people of Yakima, Washington honored their native son, Supreme Court Justice William O. Douglas, with a statue in front of Davis High School, his alma mater. The Los Angeles Unified School District named a school in Wilmington after Harry Bridges, the longtime left-wing leader of the International Longshore and Warehouse Union. There’s a bust of Bridges in San Pedro, Los Angeles’ waterfront district, and the union is currently seeking a home for a newlycompleted statue. A statue of Langston Hughes — poet, novelist, playwright, short story writer and columnist — sits in the Watkins Community Museum of History in Lawrence, Kansas. Schools in Lawrence; East Orange, New Jersey; Baltimore; Chicago; New Orleans and Fairburn, Georgia are named for Hughes. New York City named a school after left-wing congressman Vito Marcantonio, who represented Harlem in Congress from 1934-50. The Ella Baker School in Manhattan, serving pre-K to eighth-grade students, is named for the civil rights organizer. 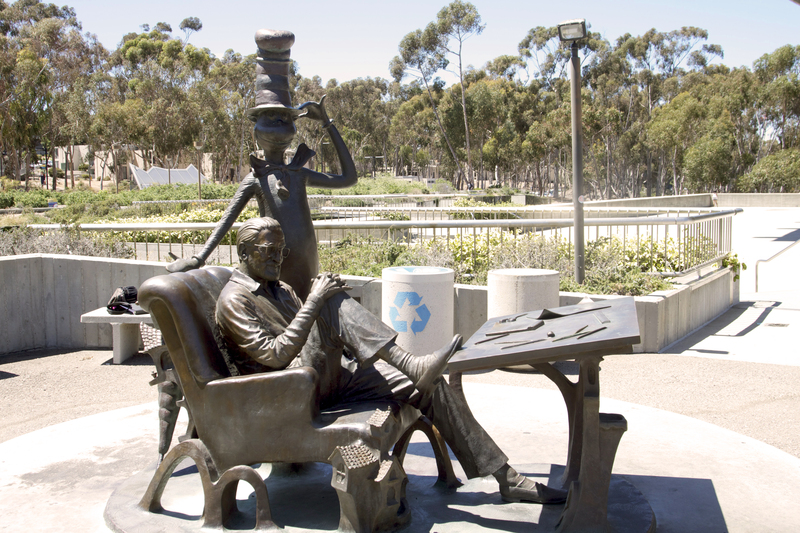 There’s a statue of Theodor Geisel — whose children’s books, under the pen name Dr. Seuss, took aim at bullies, hypocrites and demagogues — on the campus of the University of California-San Diego, not far from the Geisel Library. 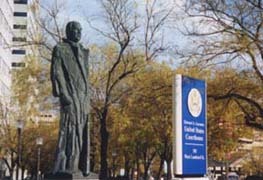 In 2010, fans of William J. Brennan, Jr., unveiled a statue of the Supreme Court justice in front of the Essex County Hall of Records in his hometown of Newark, New Jersey. William J. Brennan High School, named for the author of many far-reaching decisions including Roe v. Wade and the Miranda rulings, is located in San Antonio, Texas. The historic Hudson County Courthouse in Jersey City, New Jersey, which had opened in 1910, was named the William J. Brennan Court House in 1989. Schools named for Rabbi Abraham Joshua Heschel, the theologian who was active in the civil rights and anti-war movements, are located in New York, Los Angeles and Toronto. A statue of environmental crusader Rachel Carson was dedicated in Woods Hole on Cape Cod, Massachusetts in 2013. Schools named for Carson are located in New York City; Chicago; San Jose, California; Herndon, Virginia; Gaithersburg, Maryland; Sammamish, Washington and Beaverton, Oregon. 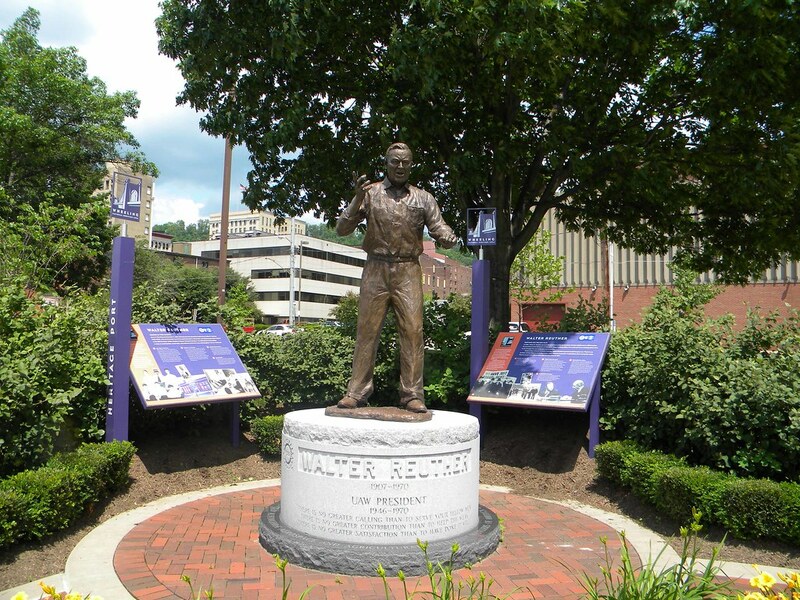 Riverfront Park in Wheeling, West Virginia is home to a statue of Walter Reuther, longtime president of the United Auto Workers and a founder of the modern labor movement. Walter Reuther High School is part of the public school system in Kenosha, Wisconsin and Walter Reuther Middle School is located in Rochester Hills, Michigan. 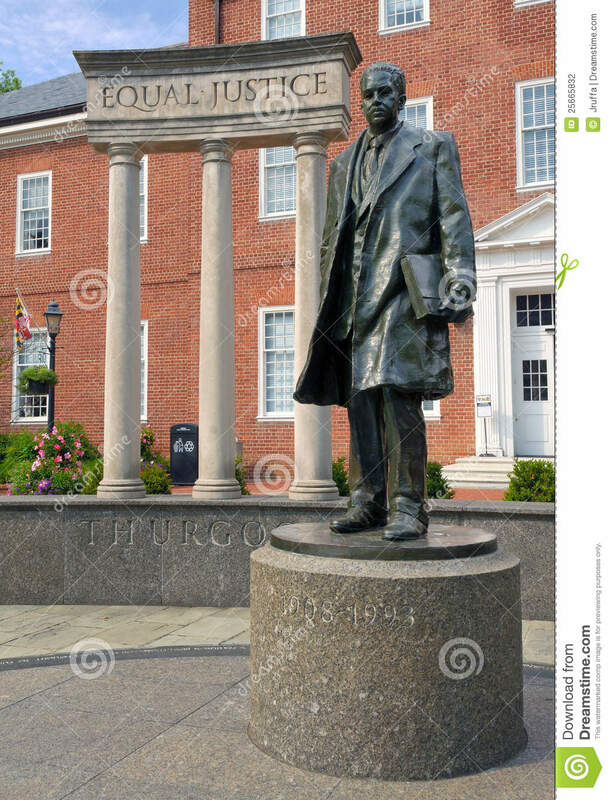 A statue of Thurgood Marshall —the courageous leader of the NAACP Legal Defense Fund, lead lawyer in the Brown v. Board of Education case and the first African-American justice on the US Supreme Court, stands in front of the State House in Annapolis, Maryland. Another Marshall statue stands in front of the federal courthouse in Baltimore. 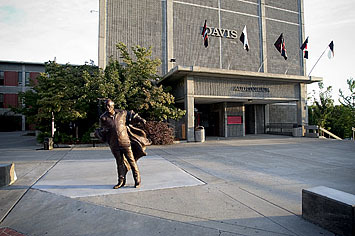 High schools in San Francisco; Dayton, Ohio; and Missouri City, Texas are named for Marshall. There’s probably no progressive American with more monuments in his honor than Martin Luther King Jr. His name adorns many schools, streets, buildings and statues, including this one on the University of Texas campus in Austin. You can also visit the National Park Service memorial to Dr. King along the banks of the Potomac. The West Chester (Pennsylvania) Area School District named its newest high school after native Bayard Rustin, a key organizer in the civil rights movement who coordinated the 1963 March on Washington. 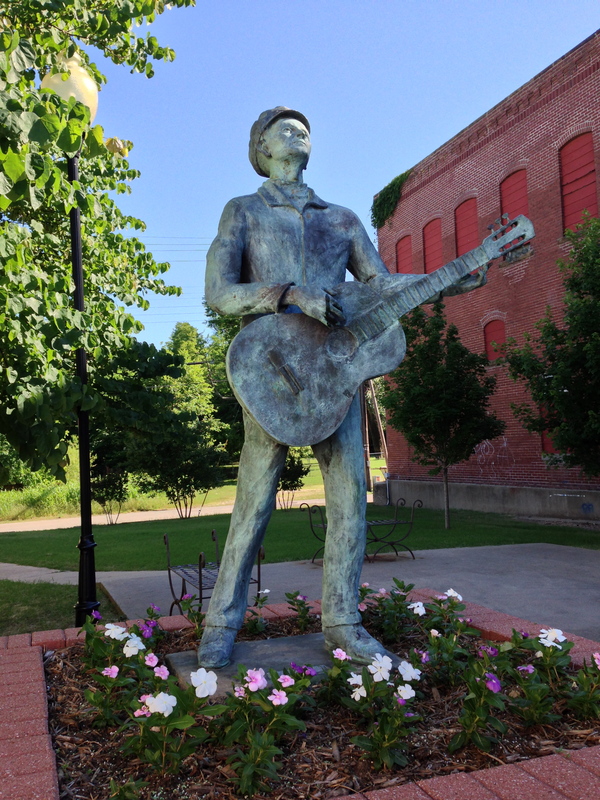 Okemah, Oklahoma honored its most famous native, folk singer Woody Guthrie (who wrote “This Land Is Your Land”) with a statue in its downtown area. Another Guthrie statue is located in Washington state near the Grand Coulee Dam, the subject of several Guthrie songs. A statue of civil rights activist Fannie Lou Hamer was unveiled in her hometown of Ruleville, Mississippi in 2012. Fannie Lou Hamer Middle School and Fannie Lou Hamer Freedom High School are located in the Bronx section of New York City. The Los Angeles Dodgers unveiled a statue of baseball legend and civil rights activist Jackie Robinson outside Dodger Stadium in April 2017. There are also statues in Brooklyn; Pasadena, California; Jersey City, New Jersey; Daytona Beach, Florida; and Los Angeles on the UCLA campus honoring the Hall of Fame player who broke baseball’s color line in 1947. Schools in Milwaukee, New York City and elsewhere also are named after Robinson. A statue of Malcolm X can be found in the former Audubon Ballroom in Harlem, the site of his 1965 assassination. 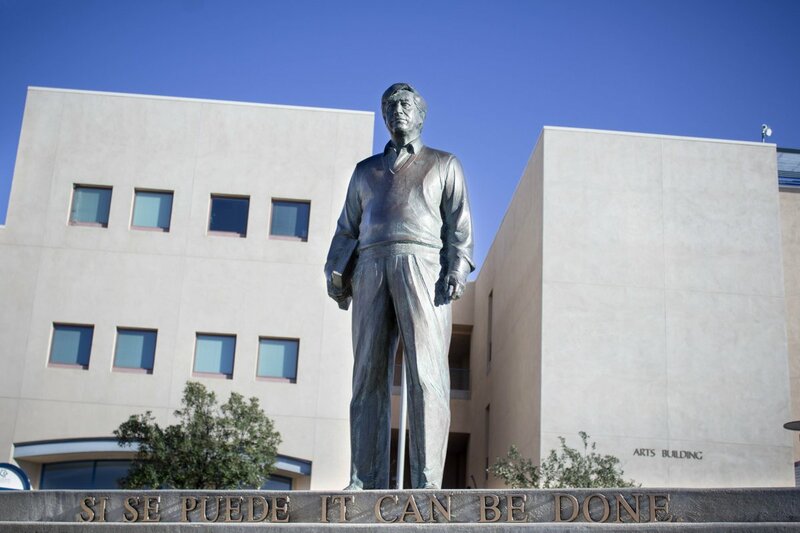 Chavez Plaza at California State University San Marcos includes a statue dedicated to Cesar Chavez as does the University of Texas at Austin. There are public schools named for the leader of the farmworkers movement in Portland, Oregon; Coachella, California; Phoenix and many other cities. New York City is home to Harvey Milk High School, named after San Francisco supervisor and the first openly gay man to be elected to public office in the United States. A bust of Milk is located in San Francisco City Hall. You won’t find statues of some of the nation’s most influential radicals and reformers. We may stand on their shoulders, but we can’t stand on their statues, because they don’t exist. Here are just a few of those who aren’t commemorated in any substantial way: Eugene V. Debs, Florence Kelley, Victor Berger, Charlotte Perkins Gilman, Lincoln Steffens, Bill Haywood, Emma Goldman, Lewis Hine, Upton Sinclair, Rose Schneiderman, Roger Baldwin, Myles Horton, Harry Hay, Saul Alinsky, Virginia Durr, Carey McWilliams, C. Wright Mills, I.F. Stone, Bella Abzug, Betty Friedan, Arthur Miller, Jane Jacobs, Jerry Wurf, Barry Commoner, Pete Seeger, Howard Zinn, Michael Harrington, William Sloane Coffin, Allard Lowenstein, John Kenneth Galbraith, Ted Kennedy, Muhammad Ali, Tom Hayden, and Paul Wellstone. Tell us who you think is missing from the pantheon of progessivism. Contact us on Facebook, Twitter or email.